Johnny Klevenhagen was born on June 12, 1912 near New Braunfels, Comal County, Texas. As a young boy, Johnny came in contact with the Texas Rangers while they were tracking cattle rustlers on the ranches near his home. He determined then that he wanted to grow up to be a Texas Ranger. He worked on his father’s ranch until he was 16, then moved to San Antonio where he worked for the San Antonio Electric Company. At 17, Klevenhagen applied to be a San Antonio motorcycle policeman. Since he did not meet the minimum age requirement, he grew a mustache, obtained a poll tax receipt with his name on it, and passed for 18. Besides serving on the Bexar County Highway Patrol, Klevenhagen also served as a Bexar County deputy constable, a criminal investigator in he Bexar County sheriff’s department and as a criminal investigator for the Bexar County District Attorney’s office. 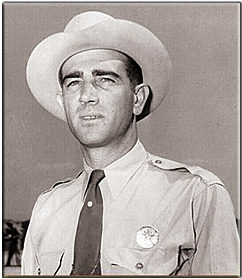 During his tenure in county law enforcement, Johnny gained a reputation as a persistent and dogged investigator, who would not shoot unless shot at and a man whose word could be trusted. Klevenhagen worked many sensational cases including the case of Alligator Joe – a man known to have committed at least two murders and who was suspected of having fed more than just stray dogs and cats to his pet alligators. In 1941 Klevenhagen’s boyhood dream came true when he received a Texas Ranger commission. He was assigned to Company A, serving out of Houston. During his years in Houston, Klevenhagen worked a variety of high profile cases. He was involved in the investigations that would eventually lead to the down fall of the “Duke of Duval,” George Parr. He also worked to keep organized crime out of Houston and led many of the strikes against illegal gambling operation in Galveston. Besides being an accomplished horseman and marksman, Klevenhagen was a licensed pilot and well-versed in the sciences of ballistics, fingerprints, and forensic investigation. He was promoted to Captain in September 1957. As with many Rangers, Klevenhagen pushed himself to the limit of his health and endurance. In December 1957 he suffered a heart attack after the funeral of a friend. After leaving the hospital and resuming his duties, he was stricken with another attack on November 15, 1958 and died on November 26, 1958 at age 46. Following a funeral service in Houston, his body was taken to San Antonio for a second service. He is buried in the Mission Burial Park in San Antonio, Texas.